Rollin' down the river with Proud Mary and her krazy krewe! 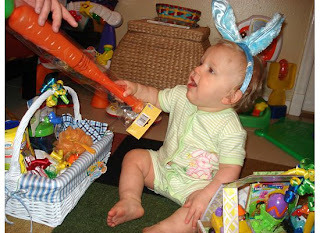 : Hoppy Easter! Easter was held at my parents house. We had a crawfish boil and other real yummy treats. I made a carrot cake...from scratch! How domestic of me! It was very very good! It wasn't very hard to make either, I was very excited about it! 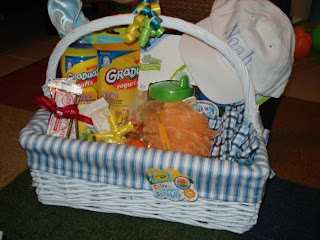 Noah received some really cute stuff ranging from PJ's to hats and ofcourse...candy! It was great to see all the kiddos together. Noah and Deuce were so cute! Noah would hug Deuce, it was really sweet. We had an egg hunt and a pinata. The pinata was quite an experience, it took forever to crack open! The kids all made out like bandits! Abigail loved the bathing suit I got her. 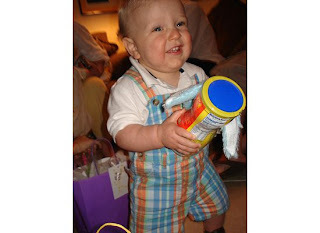 I hope everyone had a great Easter!